The book caught my attention right from the cover and being a hardbound one , it certainly had more charm. Frankly , i had to re read the first chapter. It was damn good narration and that too from such a different view point that i laughed at the end of it. So i re read it and thats how I started on the journey of the character Kumar, who is an aspiring writer. More than that , he is a collector of tales and a thinker. A very silent observer. And it is these observations and mesh of his imaginations that is the book in your hand. The people , the tales , the coversations .. nothing is any less than a trippy night , high on life perhaps. The book shows life in its various colors and shapes. And lot of feelings too. Wrapped in poetic layers and vague references to other people who are a part of each other's stories, this book weaves a plot of a middle class society and its unique residents. The people sometime bore you with their routine. There were pages i felt life came to a stand still. But you can not skip the pages. No way at all. You should not. Sanjay kumar may or may not have based this character on himself but i sure forgot that Kumar was just a character in the book. He was alive and narrating this wonderful story to me as he drank and smoked perhaps ! I just know that this book was an adventure. It needs to be read again. It takes you into a world that you want to just know more and more and yet the curiosity both enyertains and frustrates. The end is a spiral vortex of all people and events. Something i enjoyed and was too amused with it. On a lighter note , it felt like meeting a new person and getting to know him. A person like my husband who has a world of his own and one who can entertain with tales about people and things you never notice otherwise. Virgin Gingelly is not a book or novel. Bit a collection of stories that have a common root and same fertile ground to grow into mango trees. Aam log , khaas kahaniyaan. All in all , Sanjay has impressed me enough to go buy his first book and read that too. But after i completely understand this one. Some books are written to tell stories and some are written to heighten tales. 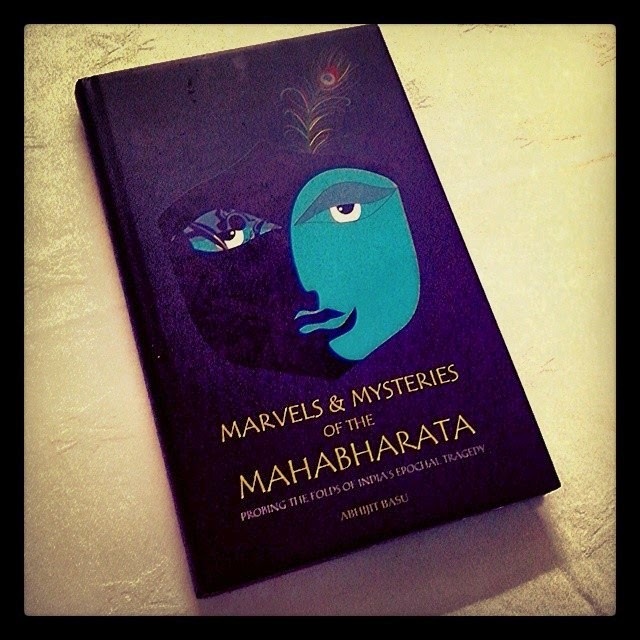 Abhijit Basu’s Marvels & Mysteries of the Mahabharata is of the latter category. The sub title ‘Probing the Folds of India’s Epochal Tragedy’ sums the intent of the book clearly. From the first chapter itself you get a sense of the amount of toil and effort Basu has put in the research. This instantly builds your confidence in him, his facts and theories. He has gone beyond and discussed the fascinating epic in reference with the Greek and Roman mythologies. He explores various shades of the characters of Mahabharata. Basu can expose you to the characters in ways like never before. The way he discusses Vyas, Vidur, Krishna, Yudhisthira and all other characters is fascinating. I personally am quite a fan and truster of Mahabharata. When Basu credited the epic and gave explanations I smiled. When he questioned and raised doubts I gave it a thought as well. This is the same effect it will have on you. A believer or a non-believer it is food for thought for both. A friendly warning, this book is meant for readers who are familiar with the epic of Mahabharata. Debutants to the epic can read it but might not be able to extract the maximum from this. It is definitely not a light read as it is full of perspectives, fact and incidents. What really is of help is the Glossary, Names & Places and Supplementary Notes chapters. The challenge with short pieces of fiction is to leave the reader wowed after reading very little. It's not the matter of holding the interest of the reader, since one can't get bored of such short pieces very soon. 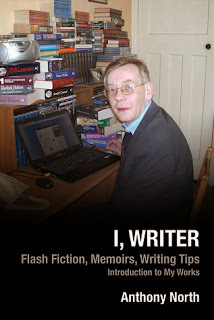 I, Writer by Anthony North brings together few pieces of such fiction that leave me with a smile because of the twist to the endings. I like it because it makes me imagine the scene, and well, most of the pieces work nicely and are interesting if not all of them. The book itself is a short one, one that you can finish in a few hours. But I feel it'd be best if you take time with it. Read a few stories at one go and then come back to it after a while, to read again. Maybe to soothe your mind between two heavy reads. This review is based on just one episode of the book ( though I have read two of them ) . Gods of Chicago is an adventure of noir urban fantasy. Hardboiled newshawk, Mitchell Brand, has the scoop on the crime of the century, the Saint Valentine's Day Massacre. Digging after every lead he can find, Brand wades knee-deep into a world of gangsters and G-men locked in a power struggle for control of the city. The bodies pile up and Brand worries that he's bitten off more than he can chew when his newsboys are added to the stack. A city magnate connected to the massacre commits suicide, and his daughter, reluctant socialite Emma Farnsworth, isn't willing to let dead men lie. After gunning for the mob, Emma and her lover, jazz player Eddie Collins, have to go underground to hide from the cops. In a deadly game of cat-and-mouse, Emma and Eddie will fight for their freedom and survival. If they're lucky, they might help a few others make it out alive when the Governor sends his army into the city's oldest neighborhoods with a single goal: clean house. In devastated neighborhoods, citizens fight back and flee. Brand and his last remaining newsboy, Aiden Conroy, have to get the real story out on the airwaves. In scenes that take Brand back to the trenches of the Great War, he and Aiden must get the evidence the city needs to see the Governor for what he is. Through it all ride a corps of tramps on rusty bicycles, the mysterious Bicycle Men, and one of them has a message for Brand. Hats off to Aaron for hooking me to this book not just in episode#1 but in just 5 pages. After a long time , I read a book that actually thrilled , felt fresh and made me forget the surroundings. It has the old charm of a western setting old novels with a hint of darkness looming just around the corner. I liked the character of Brand and more so his mode of transport. The people around him are very real and as mystical. I admired the way Aaron set the game rolling in the reader's mind from the very beginning and while he introduces and details his characters one by one, he gives a picture of the town and the forces in play there. Brand is much real hero here but it is Emma from the very beginning that wins my heart. Independent , loving , strong and yet much balanced and cautious females are loved always I guess. Every other page I finished , made me a real happy reader and I thank Aaron for this. Meanwhile Please do check the book on amazon here and have fun reading ! Strategy is a very important quality of any good leader. But what are the secrets to leadership? Chanakya, in his Arthashastra, had a concept called Saptanga, the seven pillars of any kingdom. 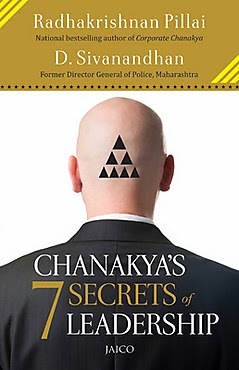 In this book, author Radhakrishnan Pillai delves into the saptanga with the example of Sivanandan, former DGP of Maharashtra and in his eyes, the archetype of an able administrator and one of India’s most respected police officers. I’ll say one thing about the book. It’s very organized and easy to understand. When it comes to any kind of non-fiction, it is important that the book’s language not have too much jargon that only a particular set of people will understand. The authors say at the start that the book is kept simple, and I felt that was true. The book is covered in sections and each section is detailed. It’s pretty useful for many of us. The thing about any book is that there will be a reader who loves the genre, and some who cannot digest it as easily. When it comes to non-fiction books, I’m most of the times part of the latter kind. It is because of this personal preference that I didn’t enjoy the book as much, and that I am not going to offer suggestions for improvement. I would say that this book might be helpful in slowly adding some qualities of a good leader into our character. Radhakrishnan Pillai is the Founder-Director of the Chanakya Institute of Public leadership (CIPL). He has represented India in various national and international conferences and has taught at educational institutes in Germany (Heidelberg, Cologne), UK (Oxford, Cambridge) and India (IIT, IIM and IISc). D. Sivanandhan is a former Director General of Police, Maharashtra, and one of India’s most highly regarded IPS officers. He has been instrumental in rebuilding the defenses of Mumbai after attacks in November 2008 and has served as member of the special task force in the National Security Council Secretariat. When I bought the book, I read the New York Times review which says “…It would be a very cool reader indeed who did not devour the whole mixture greedily.” Well, I hate to admit it, but I did have the audacity to think that I was one. After reading a few pages, I was feeling everything, but ‘cool’. The book commences with the narrator commanding the reader to listen to the tale he has to tell. The command eventually turns to a plea. The narrator justifies the plea by saying that the reader has nothing to lose if he lends his interest. Now, as a reader, I was a little cynical about the approach, as I had never read such a prologue before. However, here’s where I lost it. The first book, which is just a few pages, blew my mind away. It is an amalgamation of the craziest ideas I have ever come across. 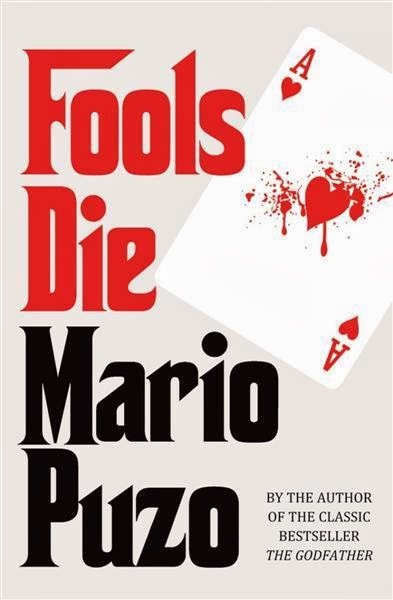 I expected Puzo to be brutal, but not from the very first page, for God’s sake! He talks about life, love, death, gender, virtue- all against each other. Just when you think that he might show some mercy, he hits you harder. And yes, you will not be comfortable throughout, but Puzo compels you to stay till the end. The protagonist is John Merlyn, who is portrayed as a writer. A great lover of literature. A faithful husband, a doting father and an honest man. But Puzo seems too obsessed with the power of destruction and makes sure that all good things come to an end and that too pretty soon. Merlyn the Magician turns out to be unfaithful and crooked at the end and still holds on to his vanity as he feels that he has won the battle of life while others gave in to Death. Apart from the protagonist, one can’t help admiring the strength and personality of the other characters who hold the plot together. Osano is portrayed as a contradiction of everything one believes to be true. He is the rebel. He rejoices in taking the credit for doing everything that makes the society wince. He is the self-proclaimed ruler of the world which he considers naïve and beneath him in every way. We could have discarded his character as a snob. But Puzo does not want to make it that easy. In bits and pieces the reader is given a dose of the true genius that Osano was or was thought to be by many. Janelle Lambert, Merlyn’s love interest, is another character of immense strength. She comes out as the true hero, as even the narrator admits not to put her down in any way. She is not meant to seen as the wrong-doer or a victim. She stays true to her character till the very end. (She is my favorite character in the book). Others like Malomar, Gronevelt and Cully Cross get their fair share of credit, as each one is unique in his own way. Malomar is respected for his devotion to movies, Gronevelt for his unshakable belief in the “law of percentage” and Cully for his cunning and charm, and a good heart. The two characters who did not get their fair share of stardom are Valerie and Artie. Both are praised for their virtues, their honesty and simplicity are their adornments. But they are quite non-existent in the battle of ideas. They are the subjects of Merlyn’s adoration but they are not the ones to pull the strings on his head when he is at his creative best. The battle of wits, the war of virtue and vice, the constant upheaval of a human mind are a few things which makes you wonder at the simplicity of your own existence ,the one which you are so familiar with. This book compelled me to come out of my comfort zone and think about things from the other side of the fence, only the grass wasn't greener this time.